Revenge by Gabrielle Lord. 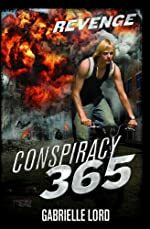 A Conspiracy 365 Novel. Review: "There's another one! There's another one!" Conspiracy 365, one of the best middle-grade/young adult mystery series to be written in recent years has added another installment, Revenge, by Gabrielle Lord. Revenge takes off where the original series stopped. Cal has come out of his 365 days on the run and is trying to acclimate himself to "normal" life. Unfortunately the press makes that difficult. Told through the eyes of Boges, Revenge brings Cal's greatest adversary back to the forefront and engages Cal and his friends in another fight for their lives. When Cal receives a mysterious not on his pillow, a sense of dread fills his soul. "30" is all it reads. When Cal's friends arrive at his house for movie night, they find that he's gone and they know right away that it's not over. Hiding from Cal's mom and the police, Boges, Winter, and Ryan are thrust into the most frightening 30 days of their lives. The original Conspiracy 365 series is unbelievably gripping - propelling readers to get through the twelve books in record time. Revenge, though a good book, doesn't have that same effect. Whether it's the fact that it's told through Boges' eyes or the sense that there's no way any of this would really happen, Revenge falls short of the expectations of Conspiracy 365 fans. That being said, Lord does an exceptional job of bring the readers up to speed with what happened for the last twelve months of Cal's life without it seeming tedious, making it possible for Revenge to be read independent of the series. However, that is not recommended. It would be preferred that Revenge be a longer book to allow for a more developed plot and potential to build suspense. All in all, Revenge is a good book, but it's just not a great book. Readers of the Conspiracy 365 series should definitely pick up Revenge, but don't hold it to the same expectations. We would like to thank Kane Miller for providing a copy of Revenge for this review. Have you read Revenge? How would you rate it?